When I saw this black and white t-shirt at Walmart, I knew I wanted to make baby leggings out of it. Claira doesn’t have a lot of bottoms and black and white goes with everything right? So I started making the leggings and decided that she needed a top to go with them because as it turns out, black and white goes with NOTHING that we currently have. Lol! So I have kind of a tutorial of what I did. I hope it inspires you in your own sewing. I start almost every project with a thrifted/cheap t-shirt. The first thing I always do is unpick the necks so I can use them later in my own collars. 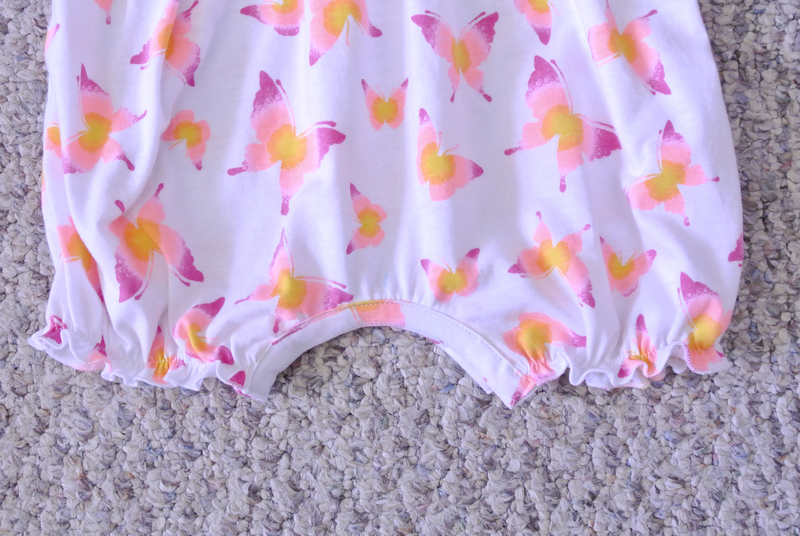 I’ve already traced my favorite baby leggings onto pattern paper so I have them for always. Although I did spend a whole day trying to find my pattern. 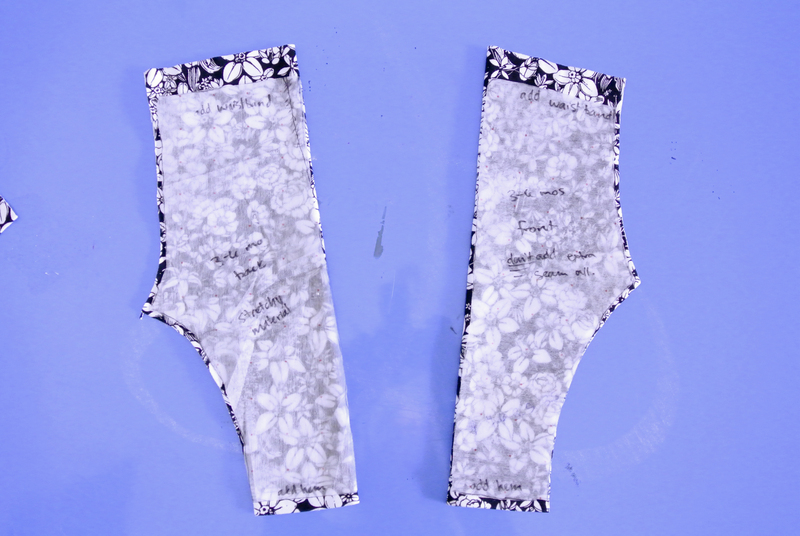 When making leggings, you don’t usually want to have a side-seam. 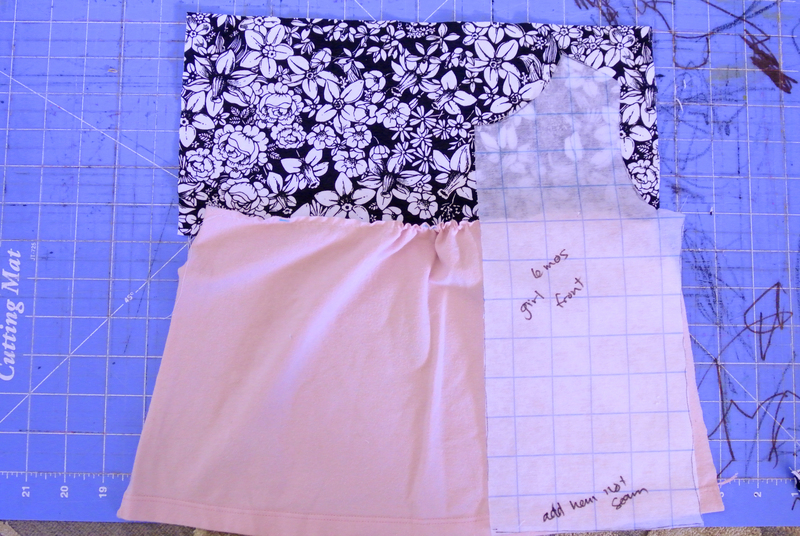 To make your pattern side-seam-less, place your front and back pattern pieces together with the straight sides touching. Overlap the seam allowance so you don’t have any seam allowance where the pieces meet. You can also see that I also line up my bottom hem with the shirt hem so I don’t have to hem the leggings at all. YAY! Now cut out your first leg. 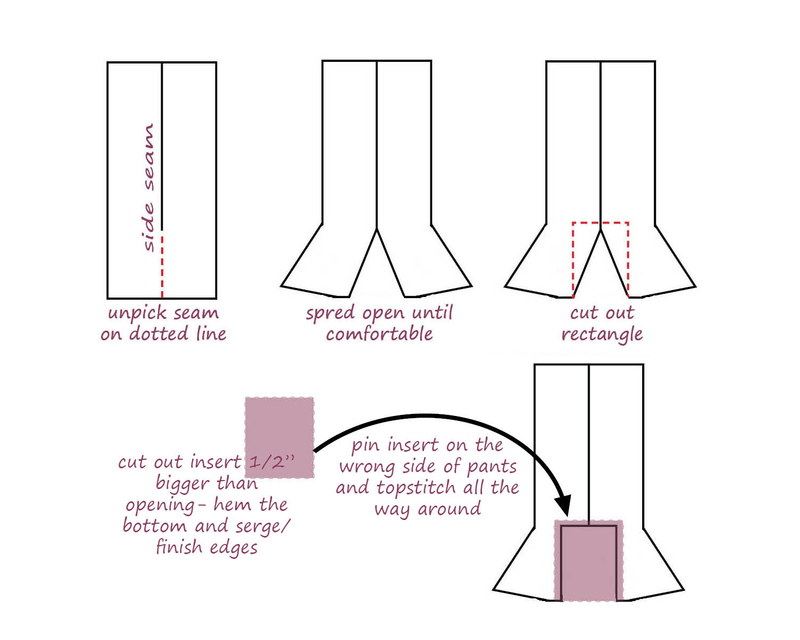 When you go to cut out your second leg BE SURE to flip your pattern over so you don’t end up with 2 of the same leg. Believe me, I did it the first time around and then only had enough material left to make them the old fashion way as seen below. I was pretty upset to say the least. Don’t make my mistake! 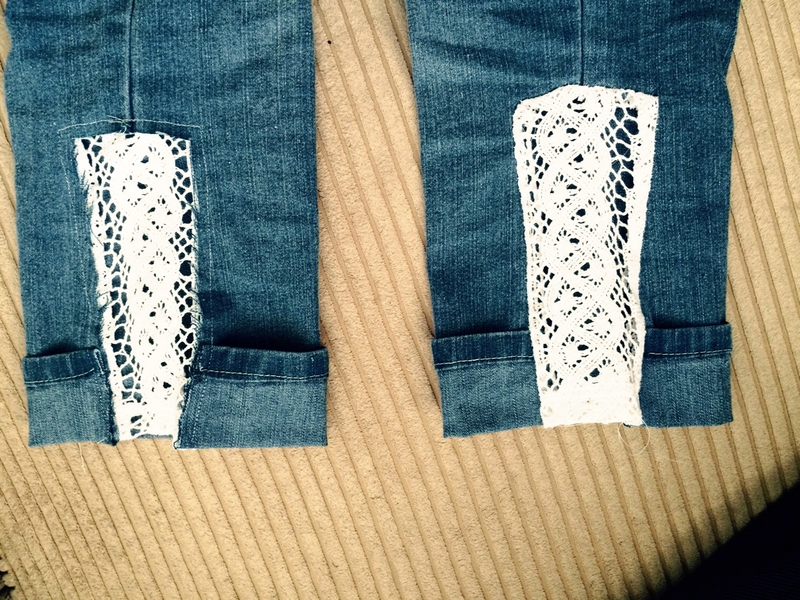 Sew the pieces together as per your usual pants sewing… place right sides together and sew both crotch arches. Then fold them so they look like pants and sew up one side of the inseam of the leg, and down the other. 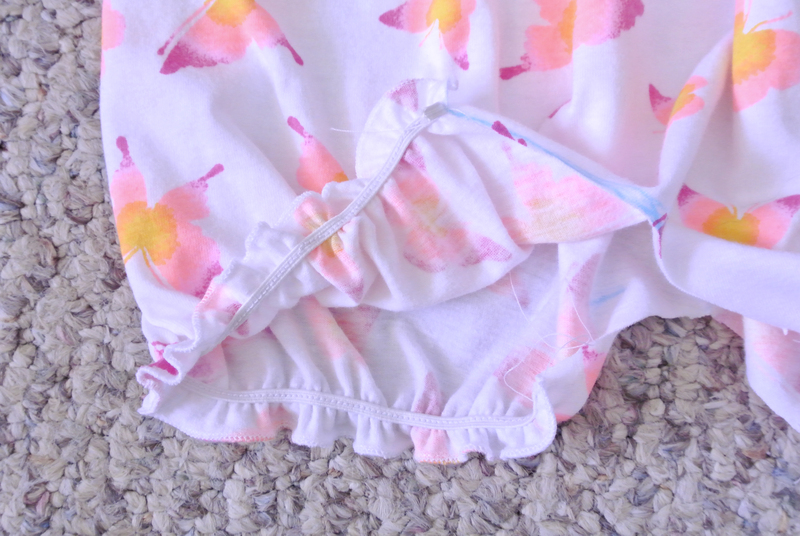 Fold over your waistband, sew with a stretch, zig-zag or other stretchy stitch and insert your elastic. Pants done. Bam! 20-30 min. So for the top I traced one of my current baby tops for sizing onto pattern paper. I wanted to have a different colored yoke so I sewed my 2 colors together before cutting out my pattern. To determine how big to make my pieces I laid my pattern on the pink I was using for the bottom and drew a line where I wanted it to come. I cut it out and gathered it slightly in the middle. 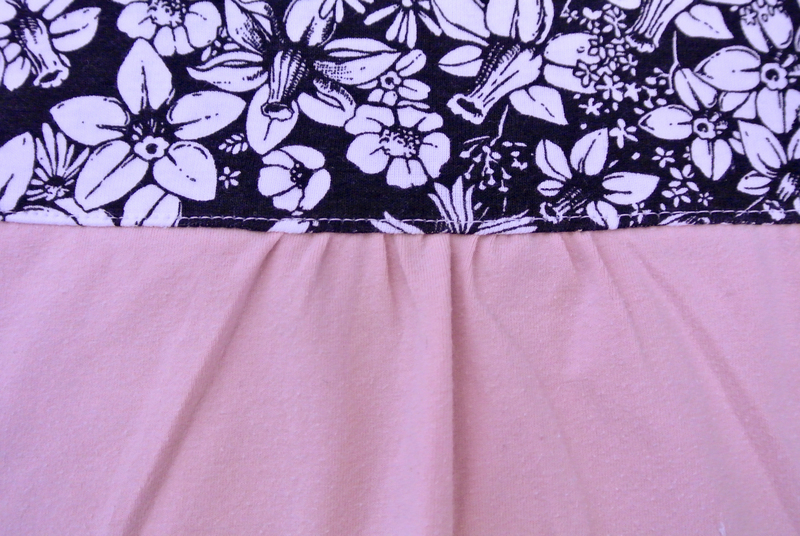 I laid the pink over the black and white to see where exactly I wanted it to be sewn on. Then I put them right sides together and sewed with a straight stitch. Then I top-stitched it to make the gathering lay flatter. It also makes it look more professional in general. 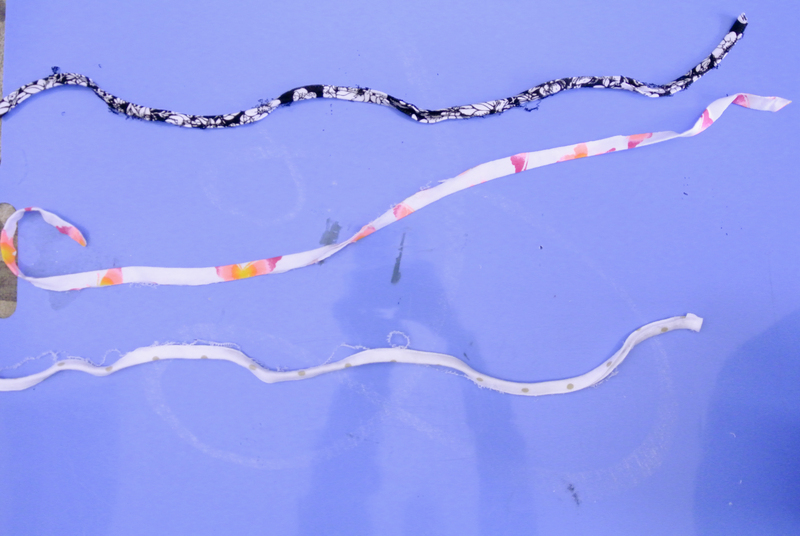 Use a long stitch length and try hard not to stretch your fabric as you go along. Now cut out your front and back. 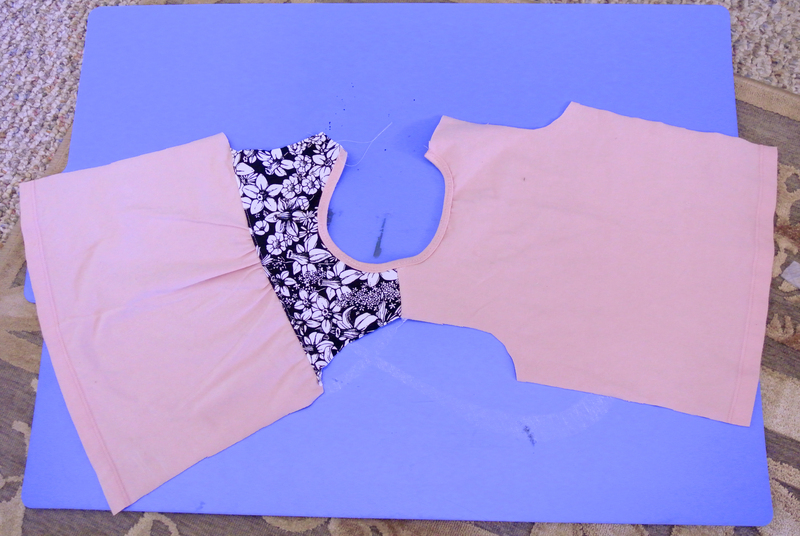 Sew one of the shoulders together using a zig-zag, stretch stitch or your serger. This is when I sew on the neck binding. 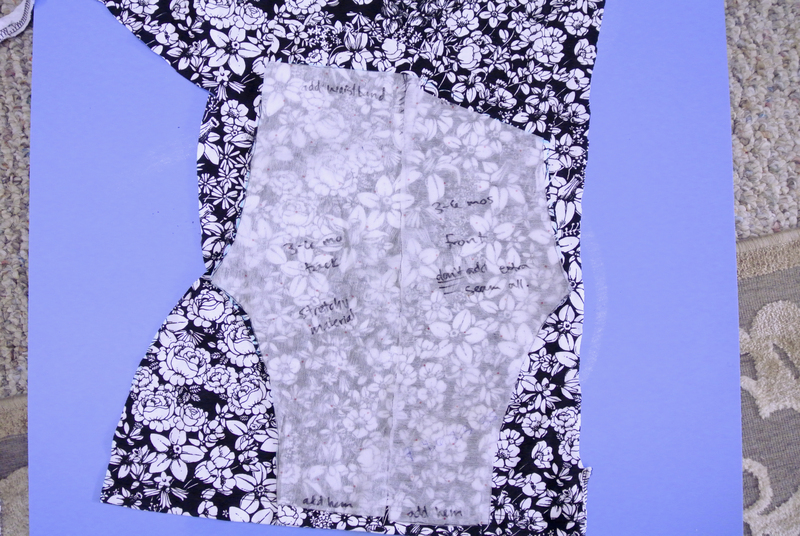 I just use the previously cut out neckline of the original shirt and use a zig-zag stitch. I stretch it slightly as I go along so it curves with the neckline. Now sew your second shoulder together. I do it this way because that’s how I’ve seen it done on store-bought shirts. Now for the sleeves. I used the leftovers from the neck binding and bound the hems of the sleeves as well using the same technique as the collar. Zig-zag, stretching slightly… etc. For this shirt I also gathered the top of the sleeve before attaching. Sew on your sleeves and down your shirt sides and you have a lovely finished shirt. 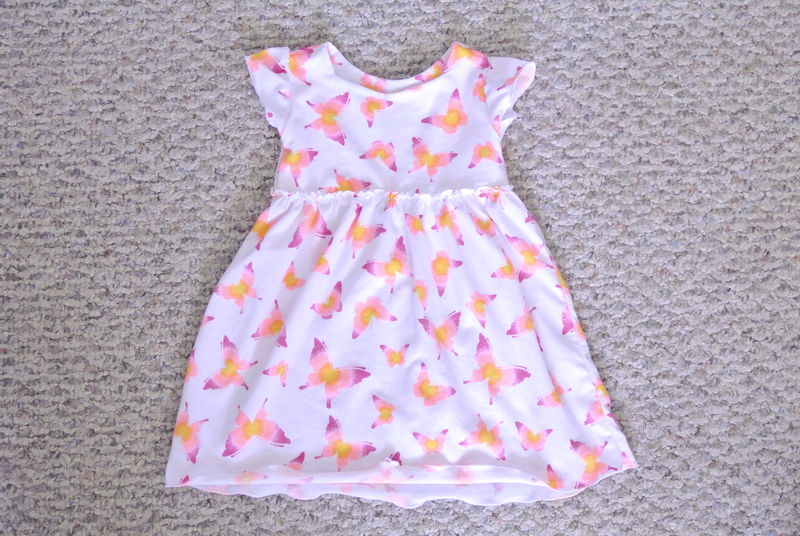 I opted to cut out some of the flowers in the pattern and sewed them on with tiny black beads in the middle. I have no idea how this is supposed to be done. I just used a needle and thread and square knotted it on the underside. I know I’m not super detailed in my tutorials, but I assume you know the basics of sewing together pants and a shirt so I kind of gloss over those parts. This is more for inspiration that really detailed instruction. One more to come. I’m so excited for it too! My baby is growing up so fast. 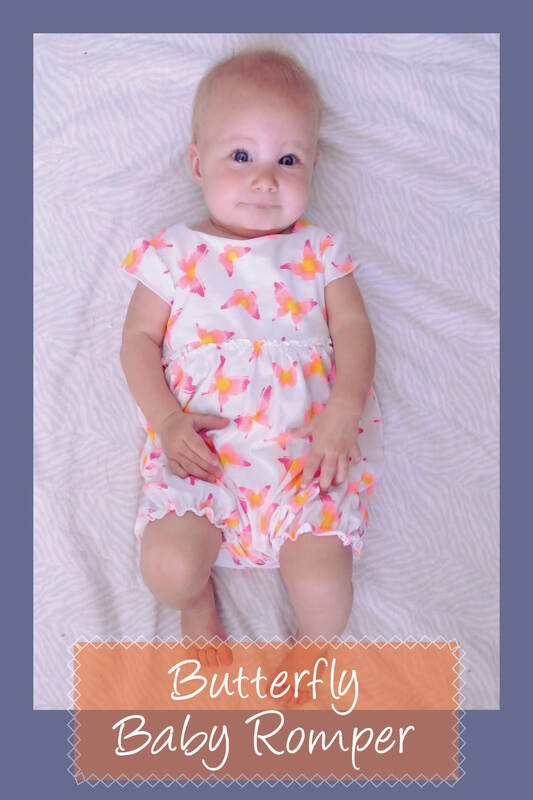 That look on her face just says, “hey mom… I’m not your tiny cuddle bug anymore.” She’s only seven months, and still pretty little, but time seriously flies. Anyway, I was babysitting my friend’s baby a few weeks ago, and couldn’t help falling in love with her little romper. It was so bright and summery. I loved that it was almost dress looking, but snapped in the middle which makes playing easier. I had this t-shirt that I bought at Walmart that was perfect for the project so I got to work! I’ll admit that my first attempt was less than awesome. 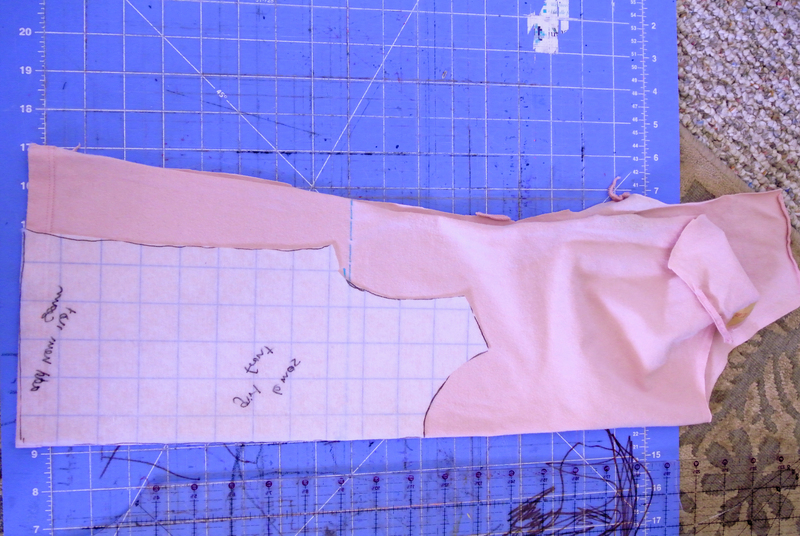 I was trying to make an easy one-piece pattern and… well it didn’t turn out so well. I ended up going back to Walmart and snagging the last shirt they had with the cute butterfly print and starting over. I basically made a dress. I love the cute little flutter sleeves and the fact that it doesn’t have any buttons or even a bias neckband. What I ended up doing was making a facing for the top and sewing it together with a stretch stitch so it would stretch over her head. It was an experiment that worked out better than I’d planned. I think I’ll make tops like that from now on, or at least more often. 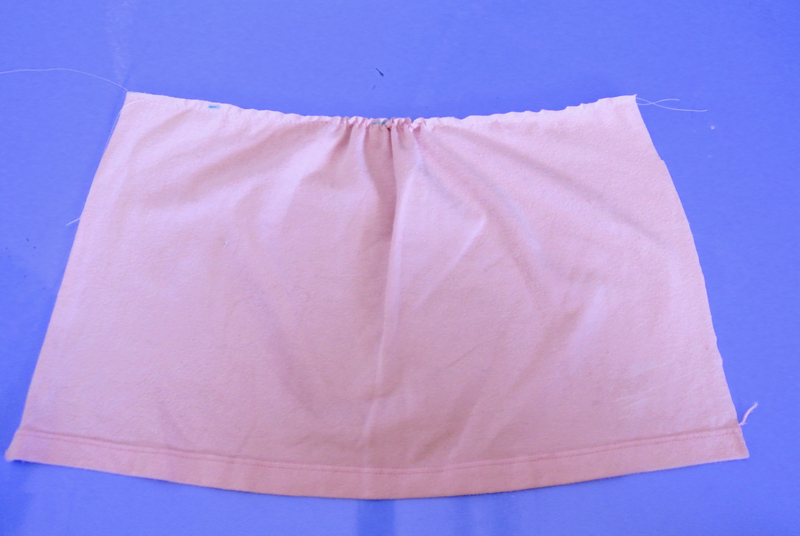 I also sewed on the skirt with a zig-zag stitch so that would be stretchy too. I did have to go back through and unpick my straight gathering stitch, but that didn’t take very long. I didn’t even hem the sleeves or the bottom. I just roll-hemmed them with my serger. I liked the look of it for this piece. So I started with the dress. I made the skirt extra long just in case. I put it on my baby and measured where the crotch should be. Then I cut out this arch. 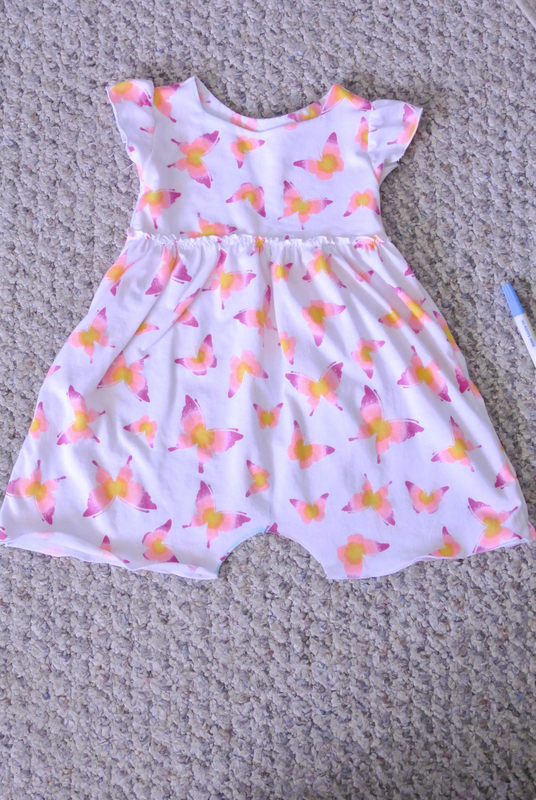 I made it pretty tall because I wanted the romper to have some longer legs/shorts. Then I put elastic in the legs to gather them up. I used 1/4 inch elastic and sewed it in with a regular straight stitch, stretching it as I went. Now all that was left was sewing some bias tape over both sides of the crotch. Pretty simple. I added some baby snaps… which took me all day to insert because I don’t have a snap tool and I used a hammer… and ta da! Really though, if you are going to be inserting snaps, get the snap tool. I had to remove bad snaps several times because my hammering ruined the snaps and they wouldn’t fit together. This is by far one of my favorite outfits that I’ve made. She gets tons of compliments on it. The sweetheart neckline is a nice added detail. 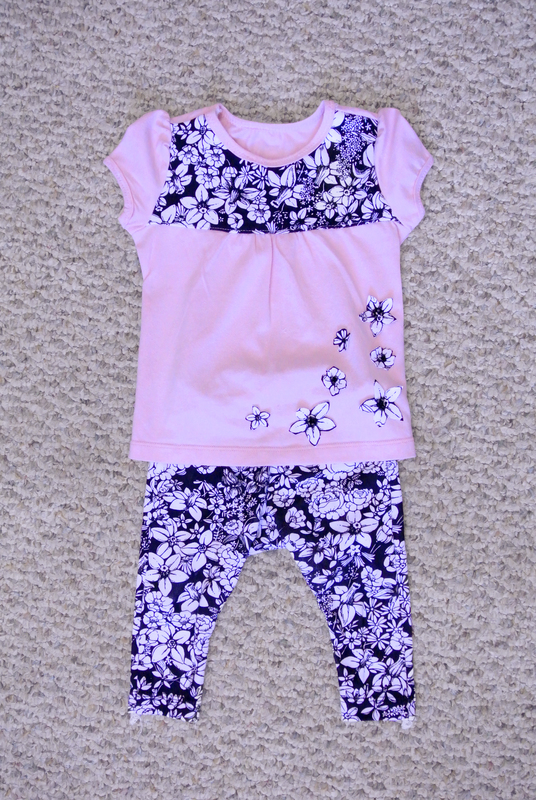 I’ve got a couple more of these baby outfits coming so stay tuned!